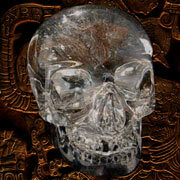 One type of unexplained artifacts which could be considered the most mysterious are crystallized skulls. Although these objects tend to be shaped more like human skulls when compared to any sort of traditional alien depiction, crystal skulls are believed to have been made by powerful ancient technologies. Fringe theories suggest these objects were created by alien civilizations and brought to Earth as a means of transferring knowledge about the universe. Certain beliefs contend crystal skulls contain all the history and future of mankind which can be unlocked when we have developed an understanding sophisticated enough to use crystalline technology. Crystal skulls first captivated attention of the world from a significant and mysterious archaeological discovery in Belize, possibly the first of its kind. In the year 1927, Mitchell Hedges, a well-known and highly respected archaeologist, was working at a dig site in the ancient Mayan city of Lubaantum. His daughter Anna is said to have uncovered a peculiar quartz crystal skull at the top of a ruined temple while exploring the site. After forty-three years in possession of the Hedges family, the perplexing crystal skull was finally extensively examined and tested using advanced analysis equipment at a Hewlett Packard research lab in California. Findings under a high powered microscope demonstrated how no metal tools were used in the creation of the skull due to a distinct absence of tool markings altogether. Analysis of the crystal material determined the specific gravity of 2.65 and a Mohs hardness factor of seven, both of which are associated to quartzite. Meaning that even conventional modern tools would prove difficult to scratch or mark the crystal. This is because cutting quartzite requires the material to be removed during the process to prevent shattering. Estimations claim the use of water and silicon-crystal sand process with hand-polishing for over three hundred years of continuous labor could achieve this result; inferring the skull must have been passed down through many generations to display this type of refinement. It is a combination of these aspects of the Hedges skull which have questioned what exactly is known of Mayan technology. Further, is there a way to possibly prove beyond any doubt the skull is not a type of modern fabrication? For example, many crystal skulls have flooded the market since the discovery. Finding out how old a quartz skull is will only tell us the age of quartzite is, not how old the carving is. Analysis of the skull structure does exhibit some interesting phenomenon. Tubes found in the zygomatic bones are precisely separated from the skull and use optical principals to channel light from the skull's base to the eye sockets. There are several light tunnels and transfers which seem to create different prismatic effects based on light sources applied to the skull from different angles. However, an image or projection has not been achieved by the guiding method. Since the Hedges crystal skull discovery in the late twenties, two additional Mayan crystal skulls were discovered in Guatemala and Mexico; then brought to the United States in 1979 by a Mayan priest. Hewlett Packard labs also tested these skulls to find nearly identical properties as the Mitchell Hedges' skull. A new age theory purposes thirteen crystal skulls exist around the planet and that mankind will enter into a new evolutionary era when all thirteen are brought together. The claim is that no information can be unlocked from a single skull and all are needed to complete the transformation. The claim identifies each crystal skull as a representation of an extraterrestrial civilization. When all thirteen are brought together, knowledge from each civilization and the entire universe will be unlocked. Similar theories suggest the crystal skulls are meant for certain individuals and that possession grants clairvoyance of a sort.